Shop the current season of C.P. 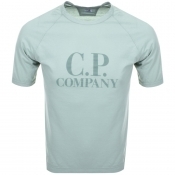 Company t shirts available to buy online at Mainline Menswear. Here you can find the most up to date selection of C.P. Company t shirts including simple basics and polo shirts with differing detail such as crew neck t shirts, V neck t shirts, short sleeves and long sleeves. Each t shirt features signature branding such as embroidered, rubberised and printed logos. Shop the full range here!